Elementary Particles | The Meaning o' Life! In Part 2. of this series (which starts here), I touched on a bit of Quantum weirdness—namely, probability, uncertainty, and wave/particle duality. But before we depart from the world of the very small (and move into the world of the merely small), I want to discuss another aspect of matter—its vast, internal emptiness. As we move out from the world of quanta and look at combinations of Elementary Particles, they begin to create new structures, and they begin to behave in ways that seem more logical to us—that is to say, with certainty. And yet, a certain weirdness remains. A proton consists of 3 quarks—2 ‘Up’ and 1 ‘Down’. The simplest atom consists of 1 Proton and 1 Electron. 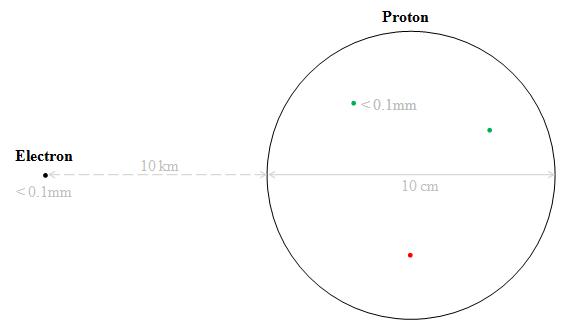 Now if we were to measure the quarks (revealing their particle nature) we would find the proton is mostly empty space compared to the size of the quarks. That is, taken together, the quarks inside the proton are 3000 times “smaller” than the proton. And when the orbiting electron is added, the size of all Elementary Particles inside the atom is 25 million times smaller than the atom itself. It’s like 4 people wandering around Texas blindfolded, very lonely. The image below gives you some sense of the emptiness inside the atom, but keep in mind that the electron is 10 kilometers away. Let’s scale this down to something smaller than a 10-kilometer atom. 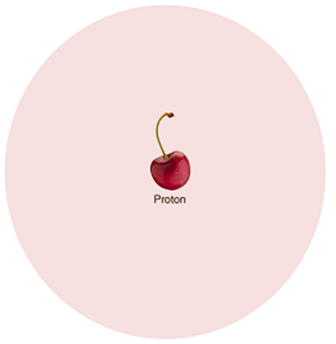 Let’s say the atom is a football stadium and the proton is a dwarf cherry on the 50-yard line. In that case the electron would be microscopic if measured as a particle, but of course we already know that electrons (when not measured) don’t behave as particles—they behave as waves, waves of probability. And it is this wave of probability in near-empty space that makes matter solid. Matter is a dwarf cherry ensconced in a pool of probability filling the size of a football stadium. And I think this realization forces us into some rather strange conclusions, for example–the hardness of matter does not result from objects taking up space; it results from the waving probability that something may be taking up space and the force of the energy holding all the emptiness together. The vacant space of my hand stops at the boundary of your body not because it is full, but because it is empty—because emptiness, it turns out, is the bigger part of what we are.